NEARLY 15,000 patients aged 75 years old and over waited more than 24 hours in emergency departments last year. The latest figures reveal this is an increase of 2,821 on last year. From 1 January to 31 December 2018, a total of 14,041 patients over the age of 75 waited in hospital emergency departments. In 2017, the figure was 11,220. 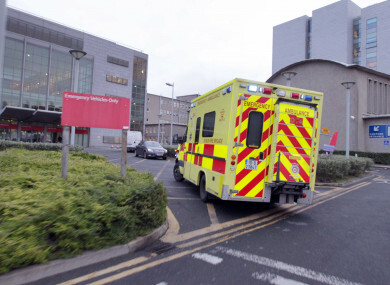 The latest HSE numbers show that University Hospital Limerick had nearly 2,000 elderly patients waiting in A&E for more than 24 hours, while Galway University Hospital had 1,737 older patients waiting more than a day. The Mater Hospital had over 1,529 over 75s waiting for that time period, while St Vincent’s University Hospital had 1,033 elderly patients waiting. The release of the figures comes as Health Minister Simon Harris and the government come under continued pressure to solve the nurse’s strike. Commenting on the data, Sinn Féin health spokesperson Louise O’Reilly said it is “incredibly worrying” that 14,041 patients over 75 years old were not seen within 24 hours last year. “Older patients are often among the most vulnerable people in our hospitals due to their age and the additional medical needs that can sometimes accompany ageing. Their being treated urgently prevents escalation of injury and ensures safety and swift treatment,” she said. She said the minister needs to look at the way older people are treated in the health service and reflect on how they are being let down. “The solution is more capacity, more staff, and the implementation of Slaintecare; however, the government are damaging capital projects across the State due to the children’s hospital overspend, they are refusing to engage with nurses and midwives to resolve that crisis, and they appear to have no interest in implementing Sláintecare,” she added. A HSE error resulted in similar figures being passed on the Fianna Fáil’s Mary Butler last year and being published in The Irish Times. The HSE has confirmed the above figures are accurate. Email “Almost 15,000 elderly people were forced to wait over 24 hours in emergency departments last year”. Feedback on “Almost 15,000 elderly people were forced to wait over 24 hours in emergency departments last year”.